Mt Takao is located at the borderline of warm-temperature zone and cool-temperature zone and various plants from both zones grow. 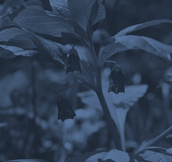 There are a lot of naturally grown plants and their visitors can enjoy seasonal flowers. 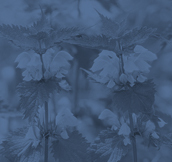 Over 1,500 kinds of plants are confirmed which is relevant to the number of kinds naturally grow in England. 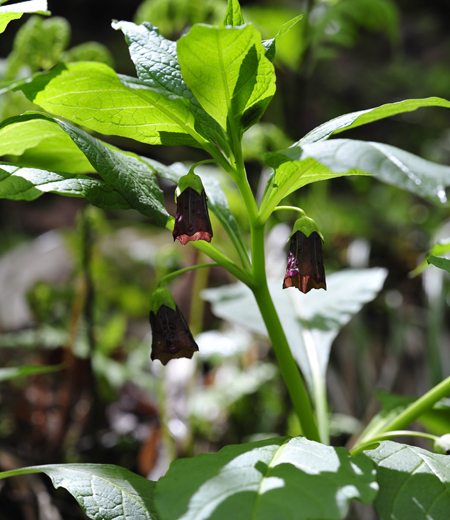 Also, over 60 kinds of plants are first found in Mt. Takao such as Takao Sumire (V. yezoensis f. discolor) and Takao Higodai (Saussurea sinuatoides). Perennial herbs (grow for several years from their same root system) found in sunny grasslands. 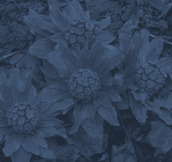 Is a unique plant blooms twice, in spring and autumn, and make the entire plant looks different. In spring, are 15 cm in height and bloom small white flowers with light purple on the back of petals, hence it is also called Murasaki-tampopo literally meaning purple dandelions. Leaves also resemble the ones of dandelions and shovel-shaped. In autumn, grow upright stem up to 60 cm long and bloom flowers but it stay as buds that is called cleistogamous flowers (never open and self-pollinating) and covered with fluffy hairs. With many stems upright resemble lances with feather of birds, hence another name Senbon-yari literally meaning a thousand lances. 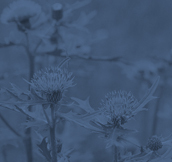 Perennial herbs (grow for several years from their same root system) found in wide varieties of areas including grasslands in mountains or hills. In Mt. Takao, found at bright roadside. 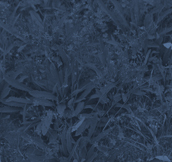 When scratching stems or leaves, produce bitter white milk sap, hence the Japanese name Niga-na literally meaning bitter plants (Only have bitter taste and are not poisonous). Stems and leaves are thin and the entire plant looks tall and skinny. The bottom of leaves has toothed margins (edges of leaves are like a teeth of saw). 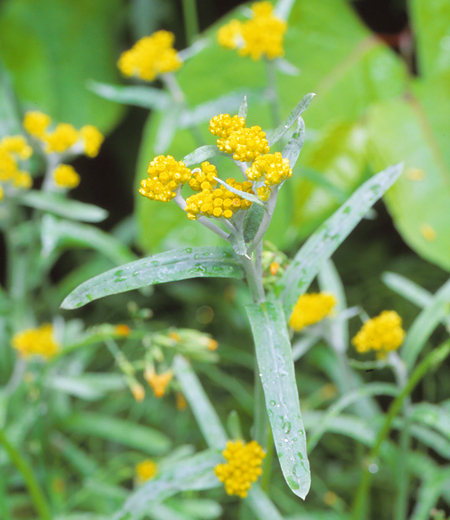 Flowers are 1.5 cm in diameter and have five to seven tongue-shaped yellow petals. Branches divided into many branches and bloom several flowers scattered on these branches. In rare cases, bloom white flowers and called Shiro-nigabana literally meaning white ixeris dentate. The larger plants with seven to eleven petals are called Hana-nigana literally meaning flowers ixeris dentate. Perennial herbs (grow for several years from their same root system) found in sunny roadside in mountains, riverbanks and grasslands. Bloom red-purple flowers facing upward on upright stems. Flowers are called flower head, many flowers bloom in clusters that looks like one flower from the distance. The size of flowers is 4 to 5 cm in diameter. 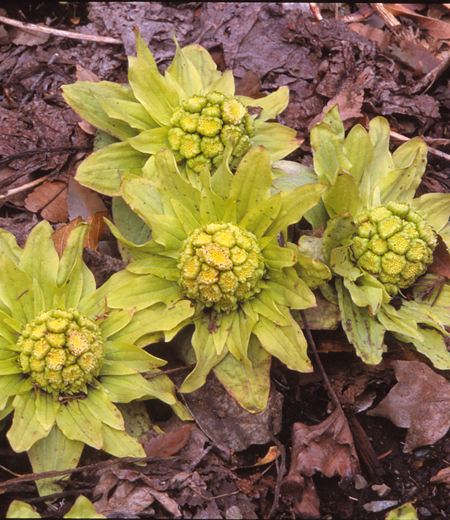 Buds like parts covering flowers are called involucre and its tips are sticky. Leaves have sharp spines at edges. 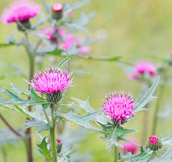 Many plants are in a cirsium genus and always difficult to identify each plant, however this is the only plant bloom from spring to summer. 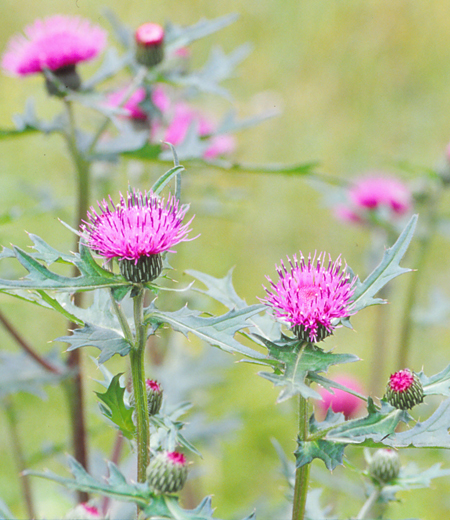 Azami (Cirsium) come from the word azamuku means to deceive because flowers are beautiful but leaves with spines. Perennial herbs (grow for several years from their same root system) found at paddy fields, riverbanks and roadside. Bloom from spring to summer but some continue to bloom in autumn. In Mt. Takao, found in sunny forest trails. 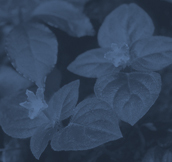 Is one of seven spring herbs and another name is Gogyo (or Ogyo). A bitter taste of sprout is an essential herb for rice porridge called Nanakusa-gayu (literally meaning seven herbs rice porridge). Was also used for making mochi sweets but after mugwort with wonderful perfume and texture is used instead, people start to use mugwort more often for mochi making. Leaves and stems have white hair densely placed and look silver from the distance. Sprout from the ground full of fallen leaves in early spring is striking. 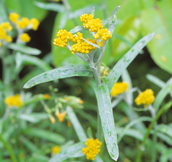 Flowers are flower head consists of many tubular shaped small yellow flowers. Perennial herbs (grow for several years from their same root system) grow as weeds in spring. 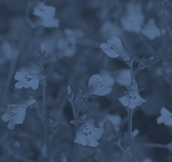 Often found them grow in clumps on grasslands. Are originally foreign species native to North America but imported in Taisho era as an ornament plants. Reproductive power is strong and it grows not only in Mt. Takao but also in open spaces and roadside in cities throughout Japan. 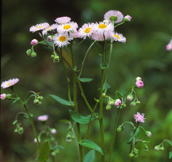 Flowers are 2 cm in diameter and white or light pink. Buds face the ground but flowers bloom facing upward. Petals are thin and look very delicate. The Japanese name Haru-shion literally meaning aster tataricus in spring was named because purple flowers bloom in spring. Have hair on the entire plants and hollow stems. Leaves are paddle-shaped and the lower parts cover stems. Perennial herbs (grow for several years from their same root system) found on slopes and at forest edges near streams in mountains. In early spring, flower stems (only bloom flowers without leaves) grow before stems grow. 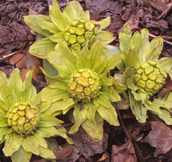 This is called Fukino-to, an edible flower bud of Japanese butterbur and a popular wild plants for nice bitter taste. Is widely known for serving tempura or marinated. Flowers are both male and female flowers. Female flowers are white, stems grow after pollinated and seeds with hair resembling the ones of dandelions are flown away by winds. Male flowers are yellow and wither after flowering. Stems grow underground and grow horizontally. 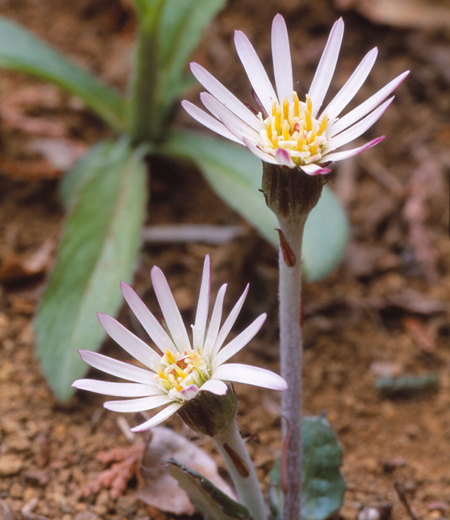 After flowering, leaves grow from the underground stems. Leaves are 15 to 30 cm long and petioles are 60 cm long. Leaves are also served boiled or stir-fried. 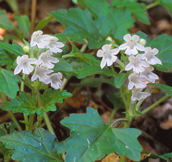 Perennial herbs (grow for several years from their same root system) found in wet tree shades and at streamside in mountains. The Japanese name Tsuru-kanoko-so literally meaning vine fawn plants was named because the shape of flowers from above resemble kanoko-shibori, a cloth dyed in a dapple pattern and vine with sprouts grow after blooming. Soft and thick stem grow upright and bloom small white flowers at the tip. 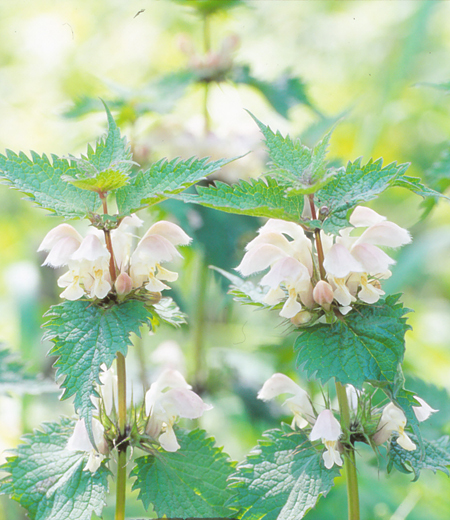 Flowers are light red right after blooming but gradually turn to white. Petals are lobed in five and stamens are not long. Leaves are pinnate with toothed margins (edges of leaves are like a teeth of saw). Leaves in early spring are not pinnate and it looks like other plant. Bear fruits with hair like the seeds of dandelions. Perennial herbs (grow for several years from their same root system) found in wet and shady areas at roadside near streams. The Japanese name Inamori-so was named because it was first found in Mt. Inamori in Mie prefecture. Also found in Mt. Takao but are not too many. 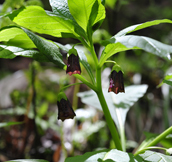 Are not easy to find as they are short plants and do not grow in clumps. The size of leaves is about 3 to 6 cm long and oval-shaped with soft hairs. Leaves are in whorls of 4 to 6 per stem and the light red-purple flower bloom like floating in the air. Flowers are about 2.5cm in diameter and lobed in five with wavy edges which looks delicate. Depending on the place of stamen, have long or short pistils. Perennial herbs on swampy forest ground near streams. Bloom in late spring after trees shoot out buds. The fan-shaped calyx after flowering resemble the hoe-shaped helmet crest (Kuwagata), hence the Japanese name Kuwagata-so. Color of flowers is light red-purple and bloom one to five from the base of leaves on upper parts of stems. 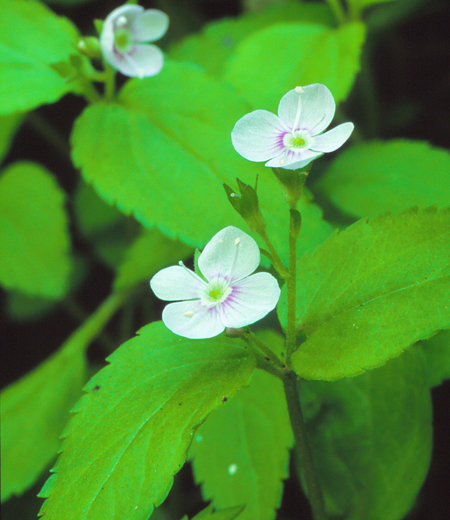 The size of flower is 1 cm in diameter and has some purple lines radiating from the center of petals. The dish-shaped corolla is parted, making flowers have four petals. Leaves are opposite with two leaves. The shape of leaves is egg-shaped with pointed tip and roughly toothed margins. 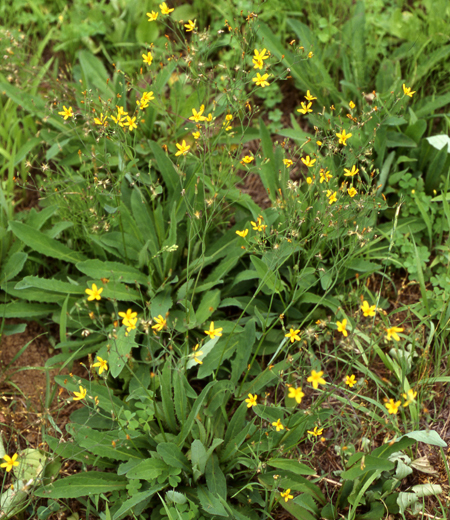 The ones towards tips of stems are large and about 3 to 5 cm. Stems and leaves have short hairs. 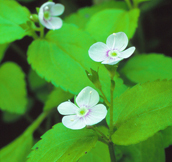 Perennial herbs found in sunny and swampy areas and in clumps on trails along paddy fields. Bears seeds but many of them does not sprout but grow by stretching branches by rooting at each nodes and hug the ground. The plants often cover ground like a carpet, hence the Japanese name Murasaki-goke literally meaning purple moss but they are not in the family of moss. Many leaves are basal, 4 to 7 long and egg-shaped or oval-shaped. 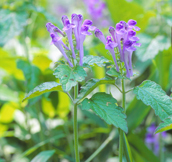 Grow upright stem in between leaves and randomly bloom light purple to red-purple flowers. 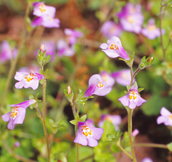 Flowers are lip-shaped and 1..5 to 2 cm long. Some bloom white flowers are called Sagi-goke literally meaning egrets moss named after the flower resembling egrets. 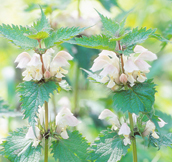 Perennial herbs found in swampy areas under broad-leaved trees including beech trees. 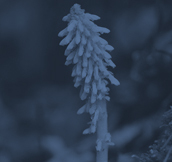 Often found near the roots of trees and grow with the nutrients from the tree and does not have green leaves. Many branches grow from the underground stem and bloom flowers from thick upright stems resembling the core of corn from the ground. In blooming season, have many tubular shaped flowers about 1..2 cm long. The spikes of flowers resembles utsubo elongated-case that store arrows, hence the Japanese name Yama-utsubo. Flowers are light red-purplish white and thin pistils with filled tips protrude and have hairy calyx around petals. They are a perennial plant that grows at humid places such sunny as in the pool of the forests and along the mountain streams (Perennial plant takes several years to grow). They are very notorious as a poisonous weed. Nevertheless, their young leaves and the sprouts are so juicy that many accidents happen that people eat by mistake. When people eat by mistake, people are tormented by a hallucinogenic symptom so bad as to run around. Furthermore, the appearance of dried root stalk resembles Dioscorea tokoro (Araceae) and these are the derivation of their name. On the contrary, the dried root is utilized for analgesic. The flower is bell contour shape about 2 cm long, dark red-purple flowers grow at the root of the leaves and dangle downward. The inside of the flowers is pale green and a yellow male stamen stands out. The edge of the flower is split into 5 shallowly. The leaf is an egged-shaped elliptically-shaped about 6 to 18 cm long with the surface ragged along the leaf veins. The seed is a spherical shape about 1 cm in diameter. 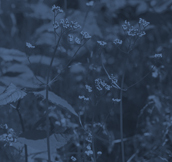 Perennial herbs found on forest floor and at forest edges near streams. Grow thin stems called runner and hug the ground. Rarely seen it alone. 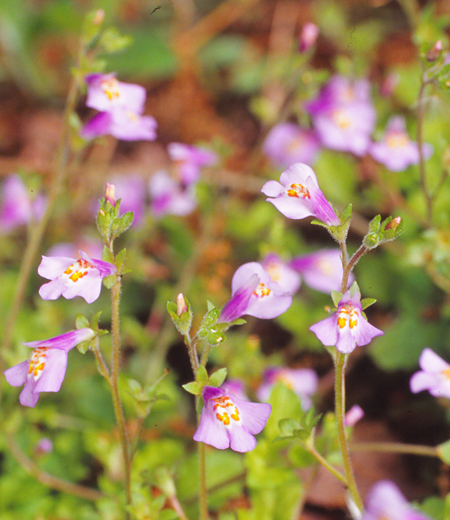 Flowers are light purple, tubular lip-shaped and 2..5 cm long. 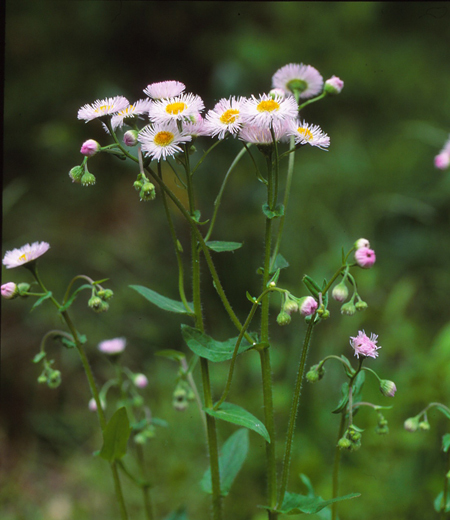 Bloom at the tips of upright stems from the base of leaves. Leaves are slightly pinnate like a heart-shaped with roughly toothed margins. Length is 2 to 5 cm and opposite. The Japanese name Ougi-kazura literally meaning fan-shaped vine was named because the shape of leaves is fan-shaped and spread runner like kudzu vine in fabaceae family after flowering. 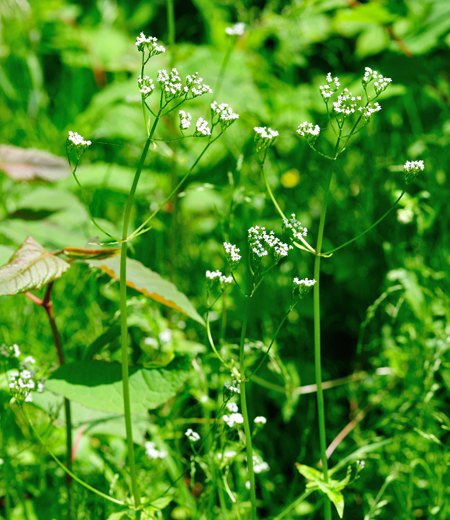 Perennial herbs found at forest edges and on grasslands from the base of mountains to mountain peak. In Mt. 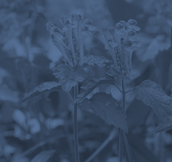 Takao, plants in scutellaria genes and scutellaria pekinensis var. transitra have leaves and truss of flowers on one side of stem but this species have leaves covering upper parts of stems. 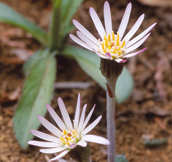 Flowers are curved tubular shape and about 2 cm long. Bloom some upright flowers at the tip of stem. 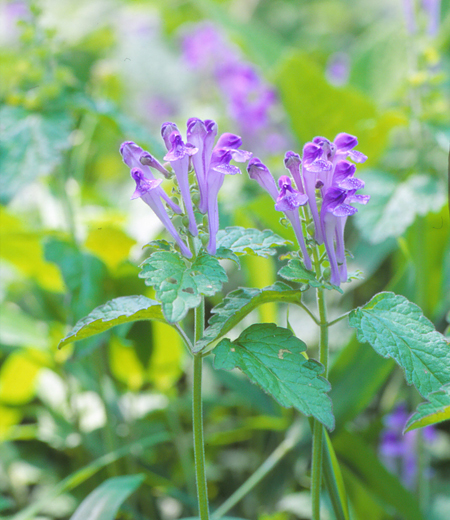 The name of scutellaria, Tatsunami-so come from the flower shape resembling the crest of wave. 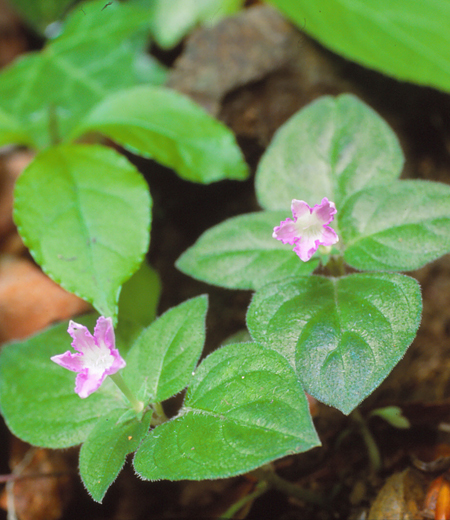 This species Oka-tatsunamiso literally meaning hills scutellaria was named because scutellaria grows on hills. Flowers are light blue-purple and stems have short hair facing downwards. Leaves are wide egg-shaped with roughly tooted margins and larger on upper parts about 5 cm long. After flowering, calyx become plate-like shape and close. Seeds grew inside of calyx pop when ripen. 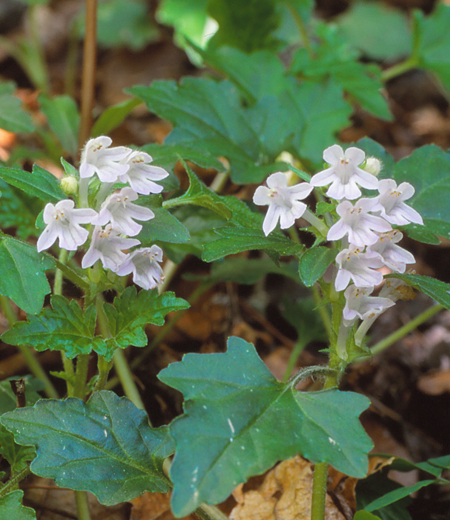 Perennial herbs found at half-shady shrubs along streams and forest edges and also on roadside in flatlands. Have clusters of tubular flowers at upper parts of stems on petioles and about 3 cm long. The Japanese name Odoriko-so literally meaning dancers plant was named after the flower shape resembling a dancer with a straw hat. Lower petals split in three and the middle one is large and long providing insects including bees a place to feed on nectar. The color of flowers is white, light yellow or pink and in Mt. 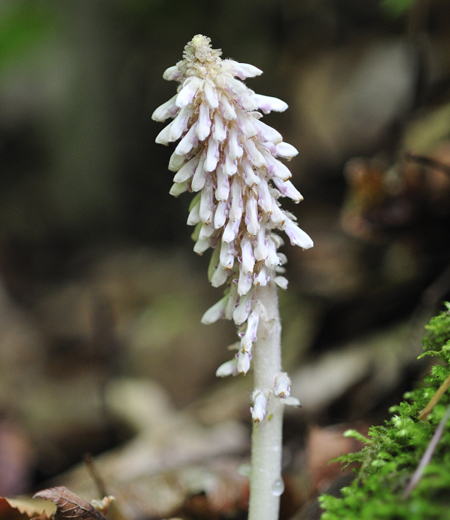 Takao, white ones are often found. Leaves are oval-shape with pointed tip and 5 to 10 cm. Edges are toothed margins. Stems are square in cross-section with long hair at nodes.